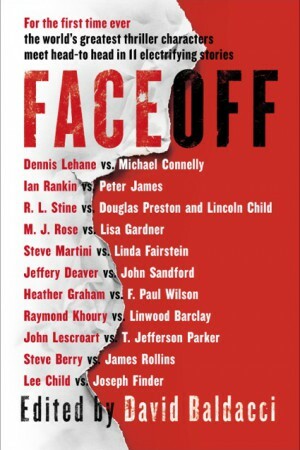 Coming in June 2014 -- the ultimate face off, 11 short stories by 23 bestselling authors pairing-off their favorite characters. In an unprecedented collaboration, 23 of the world’s bestselling and critically acclaimed thriller writers will pair their series characters in an 11-story anthology curated by the International Thriller Writers (ITW) and to be published in June, 2014 by Simon & Schuster. S&S will bring out the book on June 3rd, 2014, just in time to celebrate at ThrillerFest, the gathering of ITW that happens each July in New York City. Already, foreign rights have been sold in a dozen countries. Each author has donated his or her story and all of the proceeds from the book go to fund ITW, which charges no dues to its members. “It’s part of what we do, as ITW members,” said New York Times bestselling author Steve Berry, who will serve as managing editor working with Baldacci. A clever concept distinguishes this anthology sponsored by the International Thriller Writers. Each of the 11 stories pairs well-known series characters created by different authors, sometimes in adversarial but more often in collegial ways, and almost always effectively. Complementary heroes include John Lescroart’s Wyatt Hunt and T. Jefferson Parker’s Joe Trona, who share adventure in “Silent Hunt.” Others are far-from-obvious matches, like Jeffery Deaver’s Lincoln Rhyme and John Sandford’s Lucas Davenport, who join forces in the longest entry, “Rhymes with Prey.” Steve Martini’s prosecutor Paul Madriani and Linda Fairstein’s defense attorney cross swords in “Surfing the Panther,” but end up wielding their weapons for the same cause. The strangest pairing is in “Gaslighted,” featuring R.L. Stine’s ventriloquist dummy, Slappy, and Douglas Preston and Lincoln Child’s FBI agent, Aloysius Pendergast. Other notable duos include Lee Child’s Jack Reacher with Joseph Finder’s Nick Heller in “Good and Valuable Consideration”; M.J. Rose’s Malachai Samuels and Lisa Gardner’s D.D. Warren in “The Laughing Buddha”; and Ian Rankin’s John Rebus with Peter James’s Roy Grace in “In the Nick of Time.” This idea is so good it demands a sequel, perhaps one that reaches beyond the U.S., the U.K., and Canada for contributors.